You awake on the shores of a deserted island. The storm that carried you here is now calm. Where are you? Are you alone? Can you survive? Can you escape?? You will need to learn many skills if you are to survive. Scavenge food, find shelter, make tools, hunt animals and catch fish. 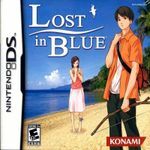 Using the touch screen and microphone features of the Nintendo DS you will discover exciting and innovative gameplay as you explore this beautiful but treacherous island.